View a "zoomable" version: Sheet 1 or Sheet 2. Map shows boundaries of counties and hundreds, telegraph line and notes and routes made by the telegraph exploration and construction parties, etc in Australia's Top End. These parties were variously led by John Ross, in central and northern Australia, GG McLachlan in northern Australia, and William McMinn in central Australia. The construction of the Overland Telegraph Line was an enormous engineering feat, stringing a strand of copper wire across the centre of the Australian continent, to link it to the underwater telegraph cable at Port Darwin that would enable almost instant communication with the rest of the world. When South Australia won the contract, Charles Todd as Superintendent of Telegraphs was responsible for overseeing the success of this endeavour. 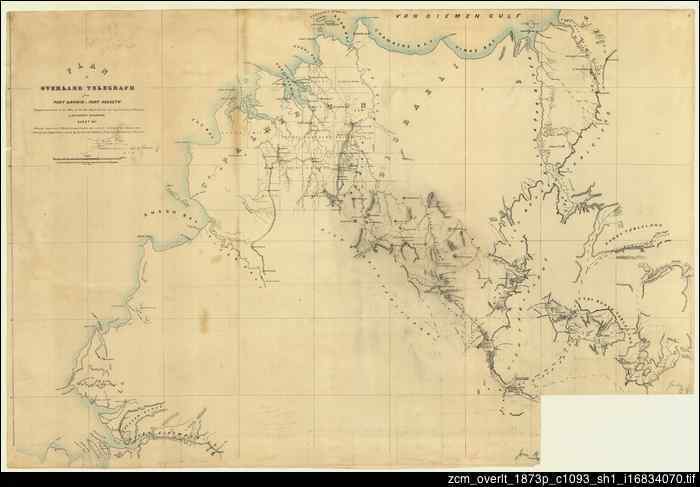 The route across the continent had only been pioneered in 1862 by John McDouall Stuart, and the settlement of Port Darwin established in 1866: there remained much exploration to select the best route for the Telegraph Line, particularly in central Australia and at the northern end where Stuart had reached the coast further to the east, at Point Stuart. Work on the line began in September 1870 and was divided into three sections: southern, central and northern. These exploration and construction parties added greatly to the knowledge of the land. The final link was made on 22 August 1872. The Overland Telegraph Line was for many years a focal point in Australian exploration with explorers leaving from or reaching the safety of the Line. In February 1942, during World War II the underwater cable was cut following the Japanese air raid on Darwin, in anticipation of an invasion. The function of the Overland Telegraph Line continued until it was finally replaced by the technology of microwave links in the 1970s.